Now that you have your Rikon 16″ Scroll Saw set up and ready to go, it’s time to make something! And if you haven’t used a scroll saw before, you may be wondering what this tool can really do. I always find that, before I just go experiment with a tool, I like to see someone with a bit of experience working with it, so I get a better feel for how it works, what speed to go at, and what things I can do that won’t be pushing to the edge of the tool’s capacity. The video below is for all of you who learn like me, and want to see the tool in action first. 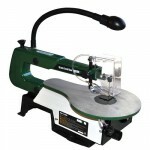 If you have further questions after watching this video, keep in mind that the Rikon 16″ Scroll Saw being sold at Highland currently comes with an excellent one hour instructional DVD featuring master craftsman John Burke. I know I said it yesterday but I’ll say it again today (and probably yet again tomorrow!) but this is a craft that you CAN learn, and a great entrance to woodworking in general. And this Scroll Saw is perfect for a beginner to learn on. And powerful enough for an experienced Scroller to appreciate! Enjoy the video! And tune in tomorrow to see a short demo of the high-speed flex shaft, currently included with the Rikon Scroll Saw package deal at Highland. This is a five day series of videos. To start at Day 1, click here. To see the next post in the series, click here.